You’re walking along a trail in Western Massachusetts and spot a slender vine growing up a tree—or along a fence post, telephone pole or old barn. The round, puffy flowers hang in bunches, their vibrant green almost blending in with the plant’s large leaves. It looks like—could it be?—hops, the ingredient that gives beer a bitter taste. One sniff and it’s for sure: the flowers exude a smell that is most certainly beer-like. This scenario plays itself out in the Pioneer Valley and all across New England, revealing what is perhaps the only trace of the region’s once-booming hops industry. Some of the plants have survived over 200 years, long after the farmers and equipment that grew and harvested this crop have disappeared. As an example, take Barberic Farm in Shelburne, Eric and Barbara Goodchild, proprietors. In addition to wool, meats and jellies, they produce a small amount of hops each year from a variety they call Stone Wall. A certain variety—which are perennial plants and spread through a rhizome—has grown along their stone wall since they bought the farm. Eric guesses it’s been there since the 1700s. The original farmers may have grown the plant for market, or, since hops has many parts that are useful, kept it for the household. Tender parts of the young plant were used in salads, its fibers and stalks were used for weaving, the leaves were fed to sheep, and an extract from its curly tendrils was even used as a dye. Industrially, hops was a major crop in New England in the eighteenth and nineteenth centuries. In 1629, European hops seeds were shipped from England to the Massachusetts Bay Colony. But the epicenter of the business shifted quickly and often. In the early 1800s, Wilmington, Mass. was the leader in the market; by the mid-1800s, New York State was the major producer, providing the majority of the country’s hops by 1850. Luck eventually ran out for the Northeastern hops growers, and the shift happened again—this time to the West. Beginning in the twentieth century, powdery mildew took a toll on plants growing in humid, moist summers (sound familiar?). Western growers began to outstrip the New England industry. Prohibition was an unwelcome blow to business, and even after a fungicide that fought powdery mildew was discovered in the 1920s, a new, equally devastating disease—downy mildew—essentially finished off the industrial hops market in New England at the close of that decade. Today the dry climate and carefully controlled irrigation systems in the Northwest have created a massively successful hops industry. Roughly 75 percent of hops sold in the United States are grown in Washington and Oregon. The farms grow several popular varieties on plots stretching an astonishing 800 acres or more. Just as the local food movement has heightened awareness of a region’s food production, so the craft brewing sensation is beginning to bring attention to the source of a beer’s ingredients. The local brew movement is upon us. “There are about five microbreweries that are excited about what we’re doing. They bought from us before we knew if it would be any good, and they didn’t know if it would be any good,” says Liz L’Etoile, director of sales and marketing at Four Star Farms, a local hop grower since 2008. The L’Etoile family farm, founded by Bonnie and Gene L’Etoile in 1986, came to grow hops as a result of a family experiment. Nathan and his brother Jacob grew up on their parent’s sod farm in Northfield and “spent our first 20 years trying to get as far from the farm as possible,” Nathan laughed during a recent interview on their sprawling 300-acre plot along the Connecticut River. Soon after their successful escape (Nathan got a degree in finance and Jacob became an electrical engineer), the men decided they wanted to move back to the farm and start their own families. “My parents said ‘Well, this farm has done a good job of supporting one family, but if we want to support three families, we’ve got to do more,'” recalls Nathan. They researched truffles, the fungus that grows on the roots of certain tree species. They planted and inoculated a small forest of oak and hazelnuts; so far, no truffles have emerged, but they might still. They dabbled in aquaculture, successfully spawning bass off-season in indoor tanks, although they ultimately rejected the idea in light of the costs and construction necessary for the large-scale version of that business. They planted large plots of land with grains like barley and spelt, and they made a test field for hops, erecting poles 17 feet tall and lacing a half-acre of land with aircraft cable between each post. “You’ll learn, this family doesn’t experiment small!” laughs Liz as we approach the test ground for their hops crop. The field has 400 plants reaching up to the sky. They are just about ready to harvest when I visit, and many of the plants are weighed down with the clusters of spring-green puffballs of the farm’s most hearty variety, Cascade. After all its experiments, the family decided to pursue hops and grains. The grains, for which the farm is becoming increasingly well known, are selling well. Sod is still the main business. But the hops are growing in popularity and if the family’s plan comes to fruition, they’ll have 10 acres in production in only a few years. I grab a handful of the hops Nathan offers and crush them in my hand: they crunch like straw. With your eyes closed, you can take a deep whiff and be transported to any brewery or brew pub you may know and love. “Wow, it’s like an IPA in my hand!” I exclaim. It’s true: the IPA, or India Pale Ale, is one of the hoppiest beers for a good reason. The flowers contain alpha acids that act as a preservative. British troops, en route to India, had to make their beer last a long time on the ocean voyage, so they produced a very hoppy beer that soon became popular for its bitter taste. India Pale Ale was born. The hops experiment has certainly been—and will continue to be—a challenge. When the family first started out, there wasn’t much information for New England hops growers; it had all disappeared with the downy mildew, apparently. They read articles, many written before the downturn in production in the early twentieth century. Gene L’Etoile toured Europe with a group from the University of Vermont to learn what was working for the smaller hops farms there. Mildew is still an issue, and pests such as Japanese beetles have provided “good lessons,” as Liz puts it. Although not certified organic (a certification process costs far more than many small farmers and growers can afford), the L’Etoiles stick to natural methods whenever possible, using neem oil to deter the beetles and often picking off insects and damaged leaves the old-fashioned way, by hand. “You’ll come out one day and they’re just there!” says Liz. Now the family has begun expanding past the experimental stage, and has constructed its first sizeable plot. We walk back to their first two and half acres, planted this year, and the place looks more like a power station than a farm: 240 poles stand on the soil, each 22 feet high. Five miles of airplane cable run between them, and many hundreds of plants. The family plans to expand each year, with a final goal of 10 acres. Given the labor and costs that go into installing such a farm, as well as equipment like a recently purchased industrial harvester from Germany, the scale doesn’t seem so crazy. “Other hops growers have said you should either have 10 plants or 10 acres, nothing in between,” says Nathan. The success is not a complete surprise: in the 2010 Feasibility and Market Research Study For Commercial Hop Production in New England, produced for the Massachusetts Department of Agricultural Resources and the Vermont Agency of Agriculture, the “growing climate and condition” of the region and the demand from the regional brewing community were shown to be able to support a viable commercial hops industry. In a survey conducted with the area’s brewers, 94 percent said they’d be interested in purchasing New England hops, if—or when—they were available. 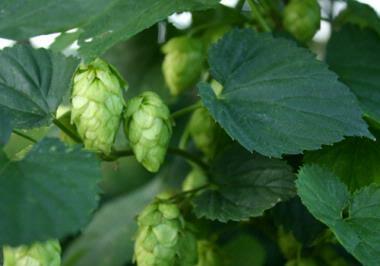 To find out more about the hops and grains at Four Star Farms, visit http://www.fourstarfarms.com.